Water fountains can make your home look regal. 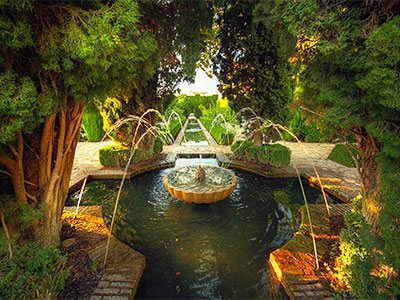 When there is a fountain in your garden, the hypnotizing and soothing sound of the water flowing can be relaxing and refreshing. After a tiring day, when you sit down and hear the music of the water flowing in your garden, your spirits will lift sky high and you will notice your tiredness disappearing. That is the magic of fountains. Most people have the misconception that they need a palatial home to install a garden fountain. On the contrary, even if you have a small garden, you can install a fountain and enhance the curb appeal of your home. Fountains are available in a wide array of sizes and styles. For instance, you can choose between an outdoor wall fountain, a sculpted birdbath or koi pond. When it comes to a fountain, the choices are endless. You will be able to find a style to suit your taste and budget. In fact, we at Unlimited Landscape Hawaii LLC, can help you choose the right style that matches with your home’s architecture and landscaping of your garden. With our designs and ideas, you will have a focal point in your garden that enhances the visual appeal of your home. It is prudent to remember in case of fountains size does matter. The size of the fountain should be such that it does not look out of place in your garden or look too small or big for your home. If you have a small home, you can go in for a short and wide fountain. In case your home is large, having a tall, tiered fountain can make your home seem smaller. Even the height of the house and fountain should be in harmony. This is why it is best to get a professional to design and install fountains, as they will be able to take different factors into consideration and help you make an informed choice. Gardens are meant to be places of relaxation, where people can sit amidst peaceful and tranquil setting and forget their worries. A water feature in the garden can make your feel more connected to nature and increase harmony and peace within and around you. 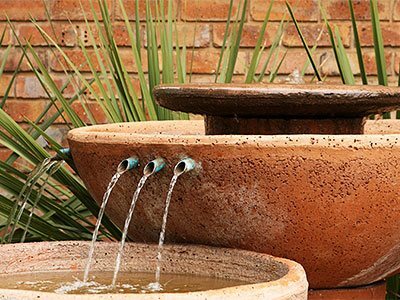 Fountains strategically placed among plants, foliage and shrubs can create a pleasant environment that soothes nerves and attracts birds to your garden. A well designed fountain can be a piece of art that enhances the visual appeal of your garden and also can boost its resale value. Whether you want a simple fountain or something more elaborate, you can get what you want without breaking sweat. With the knowledge, expertise and creativity Unlimited Landscape Hawaii LLC brings to the table, you can rest assured your dream garden is just round the corner. We are based in Wahiawa, but service nearly all of Hawaii, including Makakilo, Aiea and Honolulu. So, call us today on 808-726-9495 and speak to our friendly staff about how our fountains can make a significant difference to the way your home and garden look.